He (Philander Fitzgerald) sang several excellent songs and is a really delightful old man 76 years old. We got a compl[ete] version of John o' Hazelgreen from him & several others. 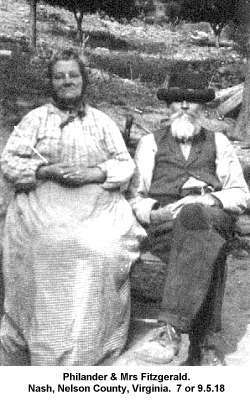 They live in a small cabin high on the mountain side. Cecil Sharp diary, 7 May, 1918. I checked a number of other American song collections for other versions of the song, but, sadly, was unable to find any other trace of 'Harding's Defeat'. It seemed that old Philander Fitzgerald was the only person known to have remembered a part of the song. When I first saw this verse I assumed that it must have been composed sometime during the Civil War and so I began to comb through my Civil War books, looking for any battle where somebody called 'Harding' was defeated because of some form of 'bad conduct'. At first, there seemed to be a number of possible candidates, the most obvious one being Abner C Harding (1807 -1874) who joined the Union Army as a private in the Eighty-third Regiment of the Illinois Volunteer Infantry, before being commissioned as a colonel and, in 1863, being promoted to a brigadier general. Then there was a Captain Joseph French Harding (born 1838) who enlisted as a Confederate soldier in 1861 and who was elected commander of Company F of the 31st Infantry in the following year. French Harding fought in the battle of Rich Mountain and later wrote his memoirs (which were only published in 1999), but, like Abner C Harding, there was nothing in his life to suggest that he was the subject of the song 'Harding's Defeat'. In fact, I could find nothing that could help me identify the mysterious Mr Harding. At this point I could, I suppose, have given up and got on with something else. But, I'm not like that and so, with a bit of lateral thinking, I began to look elsewhere for the answer. I also asked myself whether or not Philander Fitzgerald or Cecil Sharp may have got the name wrong. And that is how I came across the story, the real story, I think, about the song 'Harding's Defeat'. The person mentioned in the song was not called Harding, he was, in fact, called Hardin, and his full name was John J Hardin, a member of the Kentucky Militia. John Hardin was born in 1753 in Prince William County (now Fauquier County), Virginia, and became an officer during the American War of Independence. He fought at the Battle of Saratoga in 1777 and 'foraged against British supply lines during the winter of 1777 - 78 at Valley Forge'. He left the Continental army in 1779, but returned to service in 1786, when he took part in an expedition against the Native Americans then living in Indiana. He continued to be an 'Indian fighter' until his death six years later. In 1790 Hardin became a part of the so-called 'Harmar Campaign', when General Joseph Harmar led an army intent on subduing the Native Americans in the Northwest Territory. In fact, the 'Harmar Campaign' was something of a disaster, no more so than at the Battle of Heller's Corner, which subsequently became known as 'Hardin's Defeat'. On 19th October, 1790, Colonel Hardin, as he then was, took a scouting party of 180 militia, a troop of cavalry led by a Major James Fontaine, and 30 regulars led by a Captain John Armstrong, towards the Native Americans. Hardin had been ordered to estimate the size of the Native opposition and then to attack the village of a Miami Chief called Le Gris, which was situated at a place called Kekionga (present day Fort Wayne, Indiana), a spot where the St Joseph and St Mary's Rivers join to create the Maumee River. As Hardin approached Kekionga he saw a lone Indian on horseback. This man fled at Hardin's approach and Hardin ordered his men to pursue the rider, but not before sending Major Fontaine's cavalry back to bring some reserves into play. It was, of course, a trap and Hardin was led into a swamp by the Eel River, where his men became stuck in the mud. 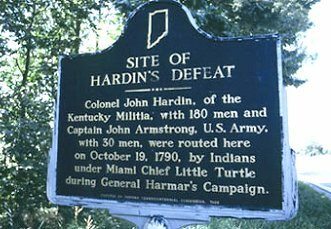 Another Miami chief, Little Turtle, led a three-pronged attack against Hardin's men and many of Hardin's troops were killed in the battle. Both Hardin and Captain Armstrong survived, although Armstrong blamed Hardin for the loss of life, claiming that only about 100 Indians actually attacked Hardin's troops. The Battle of Heller's Corner was followed by a number of other defeats for the American army and Chief Little Turtle became something of a hero to the Native Americans, who found inspiration in his actions. As to John Hardin, he died in 1792, murdered in his sleep by a group of 'friendly' Shawnee Indians, while on a mission to negotiate a peace treaty. The mission had been ordered by George Washington. No doubt the Shawnee remembered that three years earlier Hardin had attacked a Shawnee village, killing a dozen or so people in the process. Today, John J Hardin's name is remembered in three American counties, one in Illinois, one in Kentucky and one in Ohio. But the song about his defeat at the hands of the Miami Indians seems to have faded from view. Perhaps, after all, it is true that Americans prefer winners to losers! 1 - See Yates, Bradtke & Taylor Dear Companion. Appalachian Traditional Songs and Singers from the Cecil Sharp Collection EFDSS, London. 2004. p.15.